The NuBone Supplements Packaging is designed with the user experience in mind to improve the visual and data communication between the consumer, product and its users. The new fitted packaging is plastic free, recyclable, and enriches the product selection process. The NuBone Supplements Packaging is designed with the user experience in mind to improve the visual and data communication between the consumer, product and its users. The new fitted packaging is plastic free, recyclable, and enriches the product selection process. 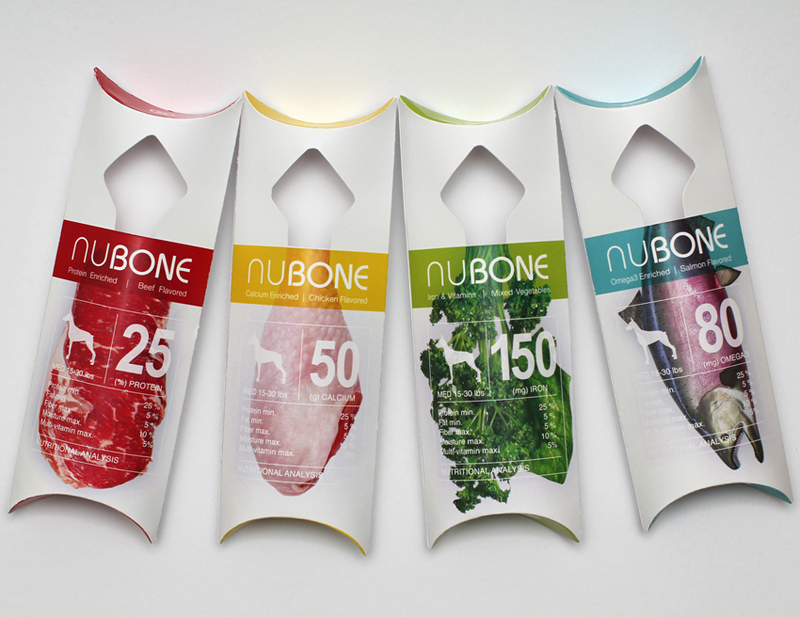 The packaging visually communicates the NuBone product line of four different flavors, beef, chicken, vegetable, and salmon; each embodies an essential nutrient for a dog’s health: protein, calcium, iron, and omega3. Nutritional chew bones are one the most popular health supplement products in the pet industry. Though there has been efforts to better communicate ingredients and nutritional value in dog food products, very few products were able to communicate the message effectively. Cute puppies images does not exactly spell out its flavor nor its ingredients. We looked to re-imagine a packaging that is visually stimulating, and communicates instinctively with the consumers. The customer should be able to quickly compare and access all essential information, such as dog size, flavor, ingredients of interest in a simple, and appealing fashion. After studying popular pet product packaging methods, we had observed that most products were packaged in plastic with no reusable value. We will definitely have to use an alternative material, if we want to leave a positive environmental impact. When you shop pet products you probably already know it’s for your pet, yet the dominate pictorial representation of pet products has always been images of pets, which doesn’t tell the consumer much about what you are buying. We wanted to deliver the raw essence of the product to the customers, through refreshing the relationship between the bone, its flavors, and nutrients. Nutritional statistics are often overlooked by dog owners when it comes to dog food, we want bring this data to the forefront to raise awareness to help them make smarter health decisions for their dog’s diet, while leaving room on the back for more intimate narratives and additional interactive content with the QR code. 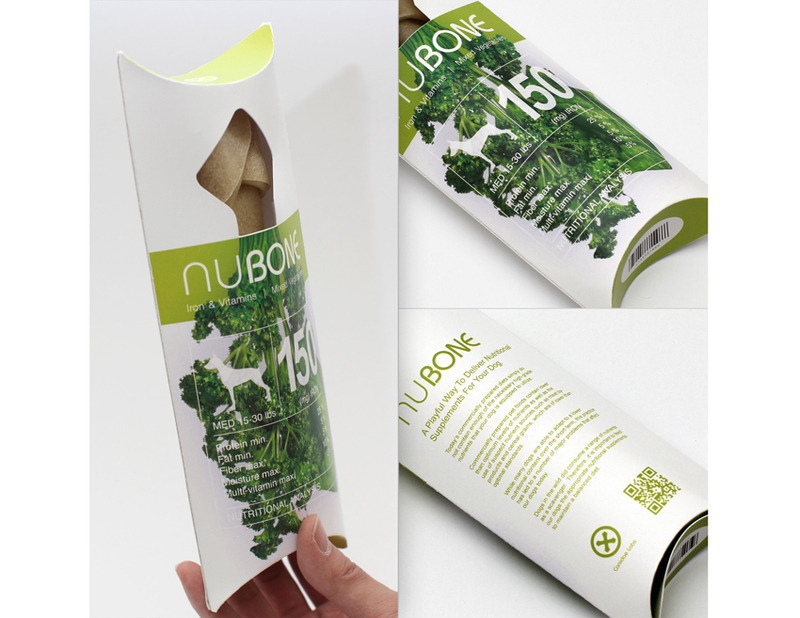 In the development process of the NuBone packaging, we had set our sights to innovate in the core areas of communication, usability, and environmental impact. We needed to know what exactly is wrong with the current visual communication, or the lack thereof. First, we had conducted a graphical analysis of current nutritional bone packagings and found that they are often colored with soft muted hues, and lacks the strong visual elements that draws attention from the customer. We had also asked dog owners and to describe the source of ingredients in the bones. More than often, the first thoughts that come to their minds were of the raw ingredients, such as beef, vegetable, and fish, rather than their scientific terms. These stakeholder and product research helped us identify where existing method fall short, and what are the actual consumer expectation. Though the bones would eventually be consumed by the dog, the imagery is always interpreted by the dog owner first. Thus it is imperative that the communication be directed at the dog owners. By introducing raw refreshing imagery in rich and appetizing colors, the dog owner can make the visual connection between the bone, its flavor, and its nutritional value with prior knowledge/connotations from the image. We had discovered that through our form and material exploration, our final solution offers the best balance between structural strength, ergonomics for handling, optimal storage volume, and surface area for communication. This would not have been possible without an iterative design process. Finally, the change of material from plastic to paper is not only more sustainable, it also extends its functionality in storage and portability. 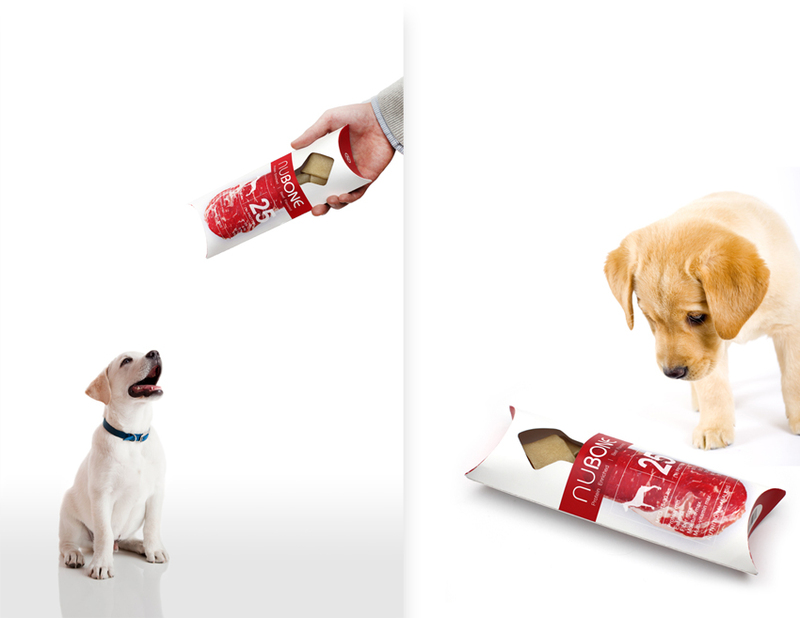 The NuBone packaging is a refreshing take on a conventional pet product packaging. It delivers essential information to its consumers with its raw, enticing imagery and empirical data. Bringing awareness to the quality of ingredient sources, educating consumers to help them make healthy dietary decision for their dog. Utilizing innate properties of the paper material, the packaging was able to encase the bone by tension efficiently with minimal volume. 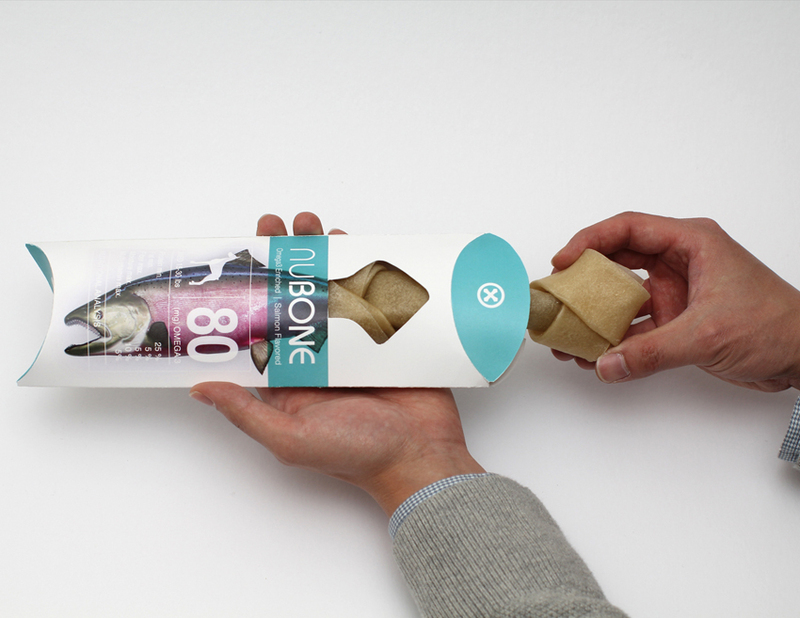 Compared to existing one-time-use plastic packaging, NuBone excels in its longevity in its recyclability and reusability, by adopting simple paper engineering techniques to transform from a flattened to a dimensional form between usage.